There may be a future project, one that looks at research facilities and laboratories not just as places where knowledge is produced, but also as places where the most extreme conditions are manufactured. 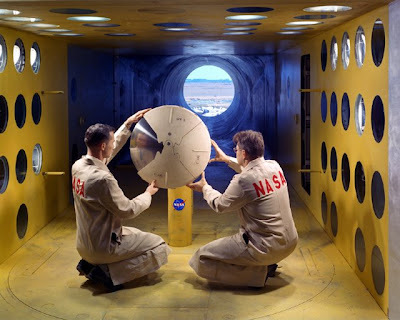 A good example is a return-flow wind tunnel (above), which uses condensers and other equipment to simulate high or low atmospheric pressures. The two following examples, however, I find fascinating for the types of extreme architectural conditions they represent. The first example I can think of is an anechoic chamber. 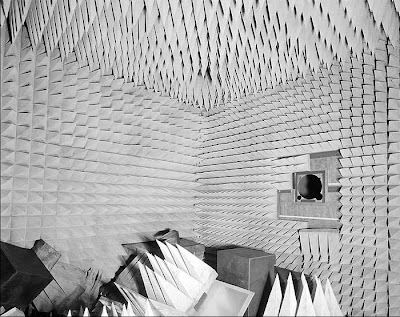 Anechoic chambers are rooms designed to curtail, shape, or even prevent sound propagation. Typical examples contain some type of foam or cork sound baffling. The example below, from the Royal Aircraft Establishment at Farnborough, England, is interesting as it is a room for testing radar equipment. This particular room, dating from the 1980s, is shielded from RF waves. The foam bafflers look menacing, almost like teeth. It is as the room were designed to literally eat soundwaves. 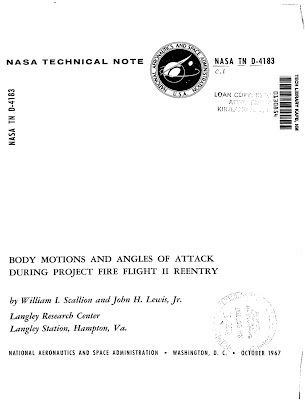 The next example comes from NASA's Project Fire, a testing program from 1964-1967 designed to simulate the re-entry of an Apollo Command Module in the Earth's upper atmosphere. The idea was to understand the conditions of extreme heat, pressure, and friction a capsule would experience upon its descent. 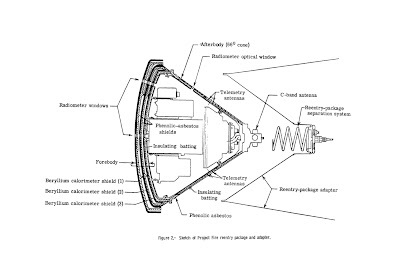 The image below shows a section diagram of the Project Fire re-entry vehicle. It is, in essence an Apollo capsule crammed with telemetry equipment and various other sensors. The vehicle was launched from Kennedy Space Center , entered low Earth orbit, and descended in the vicinity of Ascension Island. The below image shows a static test of a Project Fire vehicle. 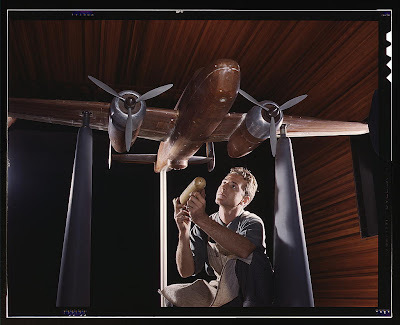 Here, technicians adjust the testing model inside a small, metallic room. On either side, large metallic perforations channel and radiate the incoming flames. Farther off, in the center of the picture, a concrete aperture provides a peek into a barren landscape. Presumably, some type of rocket booster would be placed inside the aperture and fired inside the room. The above buildings are not of the type usually featured in architectural surveys. They are of special architectural interest, however. These are rooms, if not for habitation, but for silence and incineration. It is an odd affirmation of Steve Shapin's dictum about entering the spaces of science in 18th century England: "We can, it is true, make the occasional trip to places where scientific knowledge is made. However, when we do so, we come as visitors, as guests in a house where nobody lives." Those are some amazing images, particularly the colors and the posed "look like you are working" men in them. The spaces are probably also useful as representations of national awesomeness. Do you know what they were photographed for? Just to send up to the DOD or publication or...? Great topic and great materials. One other question. I am curious about the distinction between labs as spaces for producing knowledge and labs as spaces for producing extreme environmental conditions. Is the latter really an end in itself? Or is it a means of producing knowledge? imho the most fascinating and fruitful part of tracking the production of knowledge in specific spaces is the ability to show that the knowledge is not neutral or unmarked by its passage through these spaces. If there is a similar case to be made that these spaces somehow leak out and inform aeordynamics (or other unrelated building systems) then I think you have an even more awesome argument. It'd be interesting to hear what you think of the question from Ed's talk last week, that really what he is doing is an alternate tale of modernity (if not the Modern Movement). What did you think of that, and what would you say if someone asked you a similar question? Thanks for the comment! That is precisely what I am arguing (and what I was arguing in the paper I delivered at Yale a couple of weeks back): that in addition to form, these spaces are used to "shape" knowledge. As you can imagine, I was very sympathetic to Ed's talk. I did look at his talk in terms of an "alternate" or "anonymous" (thank you, Professor Giedion) history of modernity. It was a shame that people connected the whole "air, light, space, and hygiene" thing with CIAM and modernism in general. In fact, the whole idea of looking earlier and earlier for the "sources" of architectural modernism can get old ... and I guess that's something I gleaned about the Eigen v. Cousins thingy. Ed never succumbed to the Banham tack and argued that such buildings were "excluded" from a discussion of modernism ... and this is, as you can well surmise, a good thing.